What is your favorite factory built sleeper? One of the only things cooler than a fast car that looks fast is a fast car that doesn't look fast. While it's hard to pinpoint exactly why sleepers are so cool, their appeal to car lovers in undeniable. What is your favorite factory built sleeper? While great sleepers are usually dreamed up between the ears of car obsessed individuals, some light reading on the Ford SHO Taurus for this morning's Faux-rarri limo post was all it took to start thinking about some of the great factory built sleepers. In between obvious performance cars and mundane transportation, car manufacturers have released some very interesting performance cars over the years in unexpected forms. This weekend we want to know which of these factory built surprise performers is your favorite. My favorite factory built sleeper is the W211 Mercedes E55 wagon. From the first time I read about the 469 horsepower long roof in 2003, I was sold. The idea of an AMG beast that looks like a luxury estate but could hang with a Corvette Z06 in the ¼ mile remains my ideal sleeper. 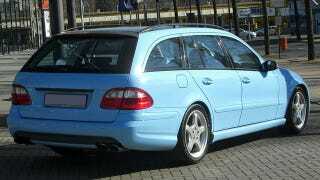 Although I have zero practical need for a station wagon, the sleeper factor makes it the E55 to have. Even though the more modern E63 has since been introduced, it is the torque monster (516 ft-lb) E55 wagon that has claimed a permanent spot in my fantasy garage. I've told you about the modern Mercedes muscle wagon of my dreams, so tell me what is your favorite factory built sleeper?